Hold onto your gardening hats, folks! Remember terrariums? A new trend revitalizing this old style is now better than ever. Creating a theme for your terrarium is easier too, with the all the miniatures now available. Remember those skinny-necked bottles and what a hassle they were? 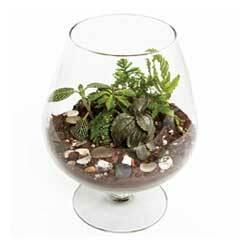 New container styles make terrariums easier to plant, simple to maintain and more beautiful in your home. What is your terrarium’s style? Tropical with ferns, arid with cacti or beach-like with tiny grasses, sand and water-like pebbles? Will you have figures such as fairies or gnomes? To choose the plants, consider the lighting where you plan to place the terrarium. If your gnome home is to be in the corner, consider using a cute fluorescent light or similar illumination to help keep your terrarium’s plants healthy and thriving. Choose your container and ensure it has enough room for your completed dream. Clear glass allows views of different layers of sand, soil and top dressing, giving your terrarium extra depth. Container shapes include hanging, footed, cylindrical, spherical, even leaning. Multi-sided geometric shapes are popular, as are smooth, curved shapes with a natural flow. If your garden includes tropical plants, consider a container with a smaller opening or a lid to increase humidity for healthier plants. Don’t forget to consider size – tiny terrariums with just a plant or two are popular and can be hung like ornaments or make great gifts, while larger containers can create an entire microcosm and unique environment for a stunning display. 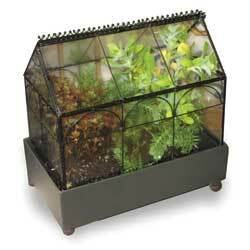 Planting a terrarium takes a little extra care, but is no more difficult than planting any houseplant. Put an inch or two of small gravel, pebbles or expanded clay pellets into the container, providing a drainage base. Mixing in several tablespoons of horticultural charcoal prevents odors. If the container is large enough, layer other colors or sizes of pebbles or sands to create visual interest when viewed from the side. Soil goes in next. Many plants grow well in light soils mixed with peat moss and vermiculite or perlite. Moistened coir is another option. Alternatively, consider special prepared soil mixes for African violets, succulents or cacti. Create a landscape plan by first arranging the plants on the tabletop to determine where they will be placed in the container, taking into account how the plants may touch the sides or top of the container. Plant the largest plant first. Dig a small hole, place the plant, and firmly tamp the soil around it. This is very important to stabilize the plants and remove air pockets. If the space is tight, smaller plants may be able to help stabilize larger plants. After placing the plants, you may want to top-dress with decorative pebbles or bark. Sand looks great around cacti. This is also the time to place fairies, cottages, twigs, larger stones, marbles and other decorative items in your terrarium to create the desired theme. When everything looks good (look at it from all sides and angles), use a small artist brush to clean any loose dirt or sand away from the sides and leaves. Use a mister to water the plants. Because the container acts as a small biosphere and much of the moisture is recycled, a little water lasts for quite awhile. Do not overwater your terrarium or the plants may rot, and replacing them can be a challenge. Place your terrarium in its new location and enjoy its beauty and your accomplishment!